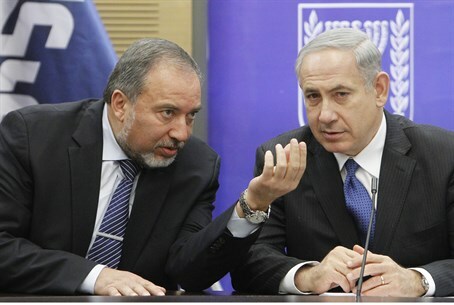 Liberman supports agreement, but asks how new PA state will handle 3 million new Arab residents. Foreign Minister Avigdor Liberman spoke in favor of Israel-Palestinian Authority diplomacy on Sunday, while rejecting some of the PA’s key demands. Liberman began by thanking United States Secretary of State John Kerry for his efforts to push a deal. “I want to express genuine appreciation for Kerry’s efforts, and for his stance regarding security in particular,” he said. “Any alternative proposal that Israel gets from the international community will be worse than what Kerry offered,” he argued. Highway 6 runs from southern to northern Israel, passing well to the west of Jerusalem. Liberman was apparently referring to his stated plan to give over the majority Arab “triangle” region in the Sharon region south of the Galilee to the PA. Israeli Arab leaders have roundly rejected the proposal. Liberman also rejected one of the PA’s key demands, saying that Israel would not accept the millions of descendants of Arabs who fled pre-state Israel as citizens. “I will not agree to any ‘right of return’ to within the state of Israel, not even of one single person,” he said. The PA will need to take responsibility for those claiming “Palestinian refugee” status, he said, including hundreds of thousands from Syria and Lebanon – countries which, he said, “will expel the Palestinian refugees from their territory” if an Arab state is created in Judea, Samaria and Gaza. The creation of a PA-led state would lead to a massive increase in the Arab population of Judea and Samaria, he noted. Liberman estimated that three million people currently residing in Syria, Lebanon or Gaza would seek to live in the region, more than doubling the population. “We always have to think of what will happen tomorrow,” he concluded. The Ramallah-based PA, which is currently responsible for roughly 2.4 million residents of Judea and Samaria, has faced constant financial crises since its creation. Unemployment is high in the region even with Israel’s agreement to employ tens of thousands of PA residents.